"Looks good, especially for the price. A compact size but works for both the adults and kids in the family. The husband put it together in about an hour, the players came ready attached to the rods, so unlike other reviews there was no problem with that." "A lovely finished product but it took two of us two hours to put together. There were a lot of individual parts to assemble and you needed to follow the instructions very carefully. We laid out all the parts to check before we started to ensure all was correct. Grandson was thrilled, so worth the effort." "Husband and son very happy with their present. Have hours of fun using it." "The children love it. It was a bit difficult to assemble but now it's up everyone is happy"
"Good solid table once put together but takes a bit of effort to build. Great fun." "Overall build quality is good, but let down badly by the rods used too move the players these have come away and reduce the enjoyment when playing! Shame really!" "The table is very good in terms of design but there is a problem with the screws which hold the figures onto the bars as they tend to work loose after a certain time, we have overcome this by supergluing the screws in place! I can't compare it to other tables as I've never really used many but apart from the above it seems excellent quality for the money." "Even if you think you're following the instruction perfectly. Double check. I thought I wouldn't be caught out by putting the wrong plays on the wrong poles, but ended up putting some players on backwards. Depending on when you realise your mistake, this can be a real moment.. It's not easy to put together, even for an experience DIY'er. Although I did do it on my own, I would suggest having help around and no time limits. It probably took me over 2 hours, taking my time over it. The quality is fine, but not great and probably reasonable for the price I paid (£100). There needs to be a bit more quality around the base, which is relatively thin card and prone to warping unless you get perfect tensions all the way around - which I didn't and the ball tend to roll where it shouldn't. But I will say that it's good value for the money. Delivery was on time and well packaged. I bought this through Sweatband who had great comms and were a pleasure to talk to on the phone (there were issues getting the correct price online)." 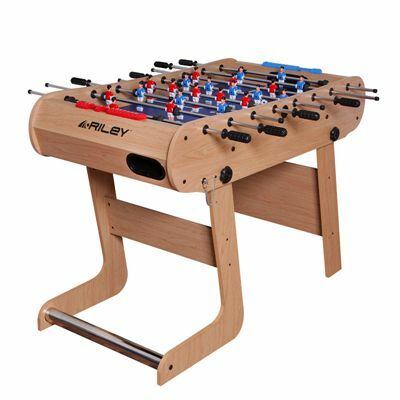 "Nice features, flimsy build quality - actually one leg was broken on taking it out of the box - playing surface does not sit absolutely flat. Disappointed ."